Wall Street didn't like the jobs report, but it didn't hate it either. Welcome to the "meh" market. The Dow Jones industrial average and S&P 500 both recovered from early selling to end higher. The small gains were enough to push the indexes to new all-time highs. The Nasdaq rose to another 13-year high, with shares of social media stocks LinkedIn (LNKD)and Yelp (YELP) leading the charge. For the week, the Dow and S&P both booked modest gains. The Nasdaq advanced 2%, thanks to a big rally in Facebook (FB). The week that changed...nothing. It was a busy week for economic reports, but not as exciting as many on Wall Street had expected. The Federal Reserve's latest policy meeting came and went without much fanfare. And Friday's jobs report was a mixed bag. "There's something for everyone in this report, whether you're an optimist or pessimist," said Kate Warne, investment strategist at Edward Jones. "That's why the market is not reacting strongly." She said the jobs report was consistent with the overall trend in the economy: the pace of improvement is slower than most would like, but things aren't getting worse. This "slow grind in the economy" has powered the bull market so far, and should be enough to support stocks going forward, said Warne. Taper timeline revised: The jobs report provided few clues for investors trying to gauge when the Fed will begin tapering its $85 billion-per-month bond buying program. Investors had been hoping for a clear sign of improvement, which would have made it more likely that tapering could begin in September. But the muddy jobs report has caused investors to reconsider that assumption. Some are now betting the Fed will sit tight until October, or even next year. "We need to see clear signs of sustainable improvement and stronger momentum in the jobs market before tapering can really start," said Ishaq Siddiqi, market strategist at ETX Capital in London, who expects the Fed to delay tapering until 2014. 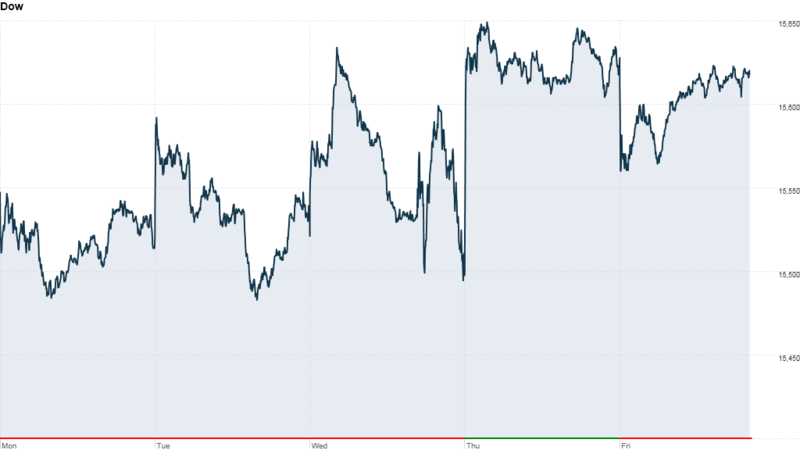 While the stock market barely moved Friday, the response in the bond market was more pronounced. The yield on the 10-year Treasury note sank to 2.6%, down from 2.74% before the jobs report came out. That may be a sign that fixed-income investors expect that tapering will be put off for several months. The U.S. dollar was also under pressure. The greenback slid 0.7% versus the U.K. pound and 0.4% versus the euro. Dell sweetens the deal: On the corporate front, Dell (DELL) founder Michael Dell sweetened a buyout deal he and Silver Lake Management made for the PC maker. Toyota (TM) reported a 94% jump in quarterly profit, helped by a weaker yen. Viacom (VIA), the media company that owns cable networks MTV and Nickelodeon. also reported a jump in quarterly revenue and profit. Best of StockTwits: Facebook has been a star performer recently, gaining 46% in the past seven trading days. But other social media companies were also having a good week, as traders on StockTwits pointed out. LinkedIn (LNKD) shares surged after it reported better-than-expected results and boosted its full-year forecast. svKatface: $LNKD Can't fight the MoMo, at least not the first few days off the block. Yelp (YELP) shares were trading at an all-time high after the provider of online reviews reported strong quarterly results earlier this week. Hewlett Packard (HPQ) shares jumped, but it was unclear what was behind the move. Some traders chocked it up to a report that HP is working on a smartphone that would compete with Apple's (AAPL) iPhone. But others said the push to take Dell private could give HP a leg up. eddyhooks: $HPQ -IMO-up move because it is believed a leveraged $DELL is good for hpq-could also opposite case it will push DELL 2 get price aggressive.